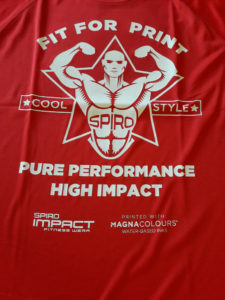 MagnaColours has specified that SPIRO’s new S287X Aircool Tee is the perfect garment for customisation with its eco-friendly range of water based inks. SPIRO’s S287X Aircool Tee offers the perfect print base for MagnaColours’ AquaFlex V2 water-based high solids ink and Migration Eliminator V2 product, and has had much success with the non-toxic water-based ink. PVC and formaldehyde-free, MagnaColours’ range of water-based inks offer the screen printing industry an eco-friendly, non-toxic alternative to plastisols. The inks are perfect for polyester fabric, including high performance garments such as SPIRO’s S287X Aircool Tee, and offer a stretchy soft feel to the garment. Other benefits include; quick curing, short flash times, formulations that are slow to dry in the screen and the ability to be pigmented to any shade. Part of SPIRO’s popular IMPACT Fitness Wear range, the S287X Aircool Tee is an air-dry soft mesh fabric tee with High Tec stretch. It features a quick-dry finish and moisture-wicking fibres to keep the wearer dry and cool. While it is particularly suited for water-based inks, the S287X is also suitable for embroidery and transfer application.